The Beta 4 version of OpenSuSE 11.1 was released today. I’m thinking of downloading and trying it, but I haven’t decided where and how I would install it. I just recently replaced OpenSuSE 11.0 with Mandriva 2009.0, so I am not sure I want to put OpenSuSE actually back on my hard drive, quite yet. I will probably install it through VirtualBox, though, and give it a spin. If you’ve tried OpenSuSE 11.1, please let me know what you think; especially if you can compare it to some other popular Linux flavors. With VirtualBox running very effectively on all of my computers, I decided to start looking into some alternative linux distributions. I am, admittedly, a SuSE fanboy. It was the first Linux distro I ever tried, and, excepting my limited usage of hosted servers running on other platforms, and attempting to use Sun Solaris 10, it’s the only *nix distro I’ve ever tried. I was so impressed with it from the start that I never looked back. However, now that I’ve begun to look into other distros, I’ve found something that’s severely lacking, so far. It seems that SuSE is one of only a very small few that release full packages anymore. Everyone else seems to have one or two choices for installation media – a live disc or a minimal installation CD. 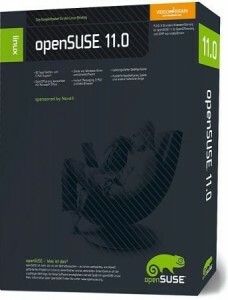 On Thursday, June 19, OpenSuSE 11.0 was officially released by Novell. 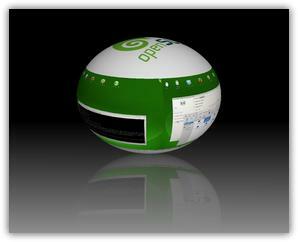 The newest version of OpenSuSE includes many new software packages on the installation DVD. Some of the new packages include Firefox 3.0, KDE 4.0, Compiz Fusion (apparently a 3-D display module – pictured at right) and a newer media player called Banshee 1.0. All-in-all, the new release from the OpenSuSE community includes over 200 new features that are only available in OpenSuSE. Having been a SuSE user for a little more than three years, I cannot recommend this download highly enough. When I first installed SuSE, I was very weary of using Linux, as I had heard everyone talk about how difficult Linux was to use if you weren’t a complete computer geek. SuSE was a different experience altogether, however. The desktop is extremely intuitive and the entire OS is very easy to use. It took very little effort to understand how to configure and use SuSE, and I very quickly came to love it. If you are curious at all about Linux, you should definitely download the new live CD from the OpenSusE download site. A live CD is a disc that contains the entire base operating system on a single disc. Live discs do not require you to install anything on your computer. Rather, the entire operating system runs directly from the disc. Of course, with a live disc, you don’t have nearly as many configuration options and you can’t really store your files effectively. However, the newer live discs from SuSE have even included a one-click install option right on the desktop, should you ever decide you want to install the system on your computer. Presumably, in preparation for OpenSuSE 11.0, which should be released very soon, the top three support forums devoted to the software have merged into one. The forums I frequented for support (forums.suselinuxsupport.de), along with suseforums.net agreed to merge with the official forums found at opensuse.org. As a result, there is now only one definitive place to look for help with OpenSuSE and Linux in general. Be sure to pop over to opensuse.org and register if you’re even the least bit interested in using Linux.